Strength, handfeel softness and dispersibility in water are key characteristics of tissue paper. Sheet strength is a crucial target in the production of tissue products, which can be pursuit through the selection of fibres, the refining level and the use of dry and wet strength aids. The choice of fibres (especially long ones) and their refining is linked to high costs and high consumption of energy. 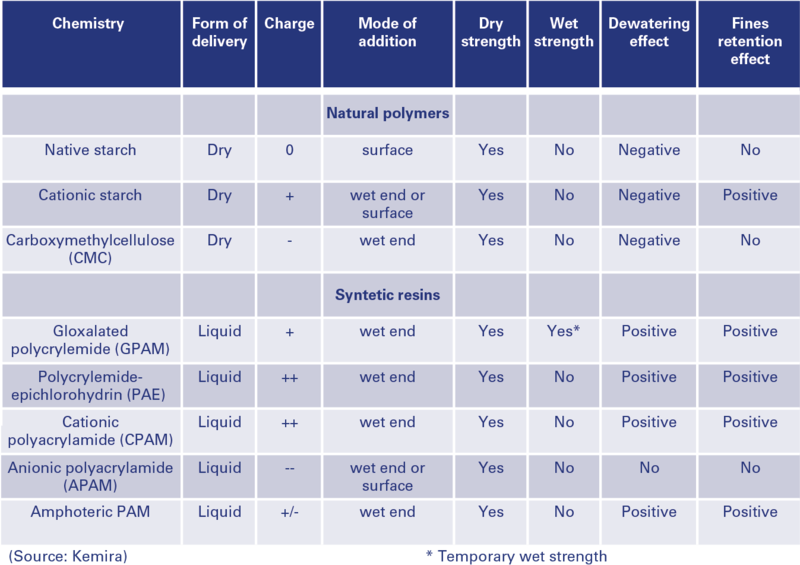 Different specifications for dry tensile and wet tensile strength characterise different tissue grades, and impact on both end-use characteristics and manufacturing efficiency. 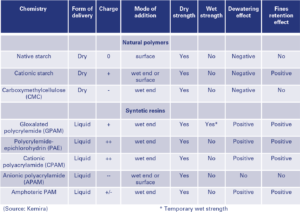 Starch and polyacrylamide are among the principal dry strenght additives used for both board and tissue manufacturing (table 1). 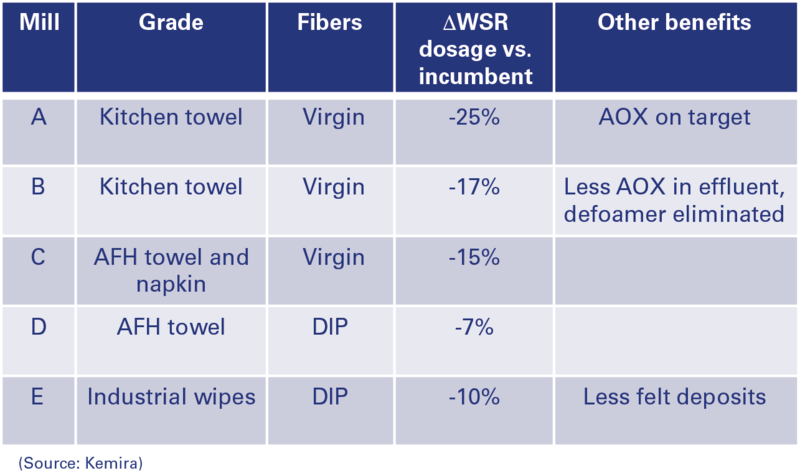 A more specific aid for tissue production are permanent wet strength resins (WSR), generally based on the polyaminoamide‐epichlorohydrin (PAE) technology. Wet strength resins are used in the manufacturing of moisture resistant grades such as liquid packaging, napkin and paper towel. Glyoxalated polyacrylamide (GPAM)-based technology is used to provide temporary wet strength for niche application in the production of sanitary products intended for disposal into a septic system. Wet strength resins also offer the opportunity to better balance the charge on fines and fibres and to increase the global efficiency of the productive process, also in terms of energy consumption and dewatering. «Wet strength resins chemicals are one of the main contributors to the tissue issue from a technical point of view», said Kemira’s Senior manager, Business and application development, P&P Emea, Dr. Vladimir Grigoriev during his presentation at the Tissue World Milan 2017. Common paper strength agents (source: Kemira). The dosages of wet strength resins used to produce tissue paper highly impact on production costs and consequently on profitability, the key driver of any type of business: the costs for the supply of raw materials and energy – coupled with the increasing regulatory constrains and the market’s pressure on price and quality – represent the main issues tissue makers have to face with respect to the challenge of profitability. «Regulatory constraints put more pression on the bottom line», said Grigoriev. Wet strength resins are part of the raw materials and their high consumption impacts on industrial costs. WSR spending based on PAE chemistry is up to 10-20 €/t, according to Keimira’s Senior manager Vladimir Grigoriev. An additional constrain will start Sept. 2018, when the new EU limit for adsorbable organic halides (AOX) in the effluent (50 g/t paper) will come into effect. There are many factors governing strength development. The chemical control of tissue strenght represents a flexible tool; the choice of the more suitable resin depends upon a number of factors including its effectiveness (or the impact on a specific quality parameter), the program cost, the effect on machine runnability and productivity, ease of use, product availability and shelf life. The choice is also influenced by the need to control levels of «adsorbable organic halides» (AOX), the organic reaction products deriving from the interaction of residual lignin from wood fibres and chlorine/chlorine compounds used for bleaching. «There are two ways to control AOX in the effluent. The first one is to use wet strength resins with a low AOX impact. But the technologies comes with additional costs, because they require post-cleaning and the efficiency of the resins falls down, some times up to 10%», explained Vladimir Grigoriev. 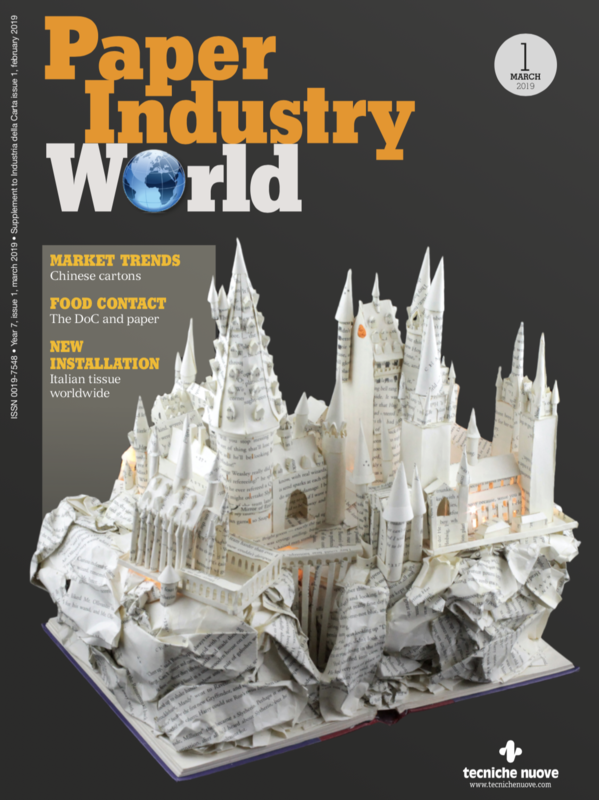 According to the expert, a better way to achieve the goal might be to use less AOX wet strength resins: this approach allow to improve the economics and to lower AOX levels in the system. A lower wet strength resins usage is advisable in order to improve profitability (i.e. to decrease costs). The expert from Kemira discussed three different approaches to reduce the impact of WSR, based on the use of high efficiency resins WSR promoters. Dr. Grigoriev presented at the Tissue World the results of recent trials Kemira conducted on samples of different grade and origin of the fibers, and coming from different mills (table 2). «The use of FennoStrenght wet strenght resins allowed in most of the cases a 10 to 15% better efficiency compared to standars currently on the market», said Grigoriev. Less wet strenght resins in the system also helped achieving AOX target levels in the effluent and lowered the risk of foam and felt deposits. Summary of trials with FennoStrenght high efficiency WSR (source: Kemira). Third and fourth generation resins greatly lower AOX contents in the effluent, but their costs are much greater than those of G2 resins, explained Grigoriev. In figure 1, blue balls represent standard products on the market compared to Kemira’s high efficiency resins (green balls, the size of the balls represent the cost in use), which are characterised by the highest azetidinium level in the market. According to Grigoriev, FennoStrenght wet strength resins are particularly suitable to achieve high WSR efficiency while maintaining a relatively low cost in use and with no increase of AOX in the paper. «You need less of this products to reach the same wet end target. Therefore, you can have better economics and low AOX», said Kemira’s representative. The efficiency of the wet strength resins might be reduced in standard post-cleaning processes, added the expert. «For the most demanding customers we offer also super-clean products of generation 3 and 4». 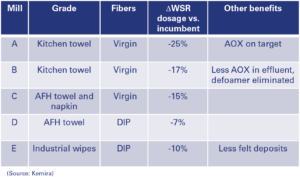 The case study presented by Grigoriev used FennoStrenght in comparison with an incumbent wet strength resins in tissue towels’ production. It showed a reduction of 25% in dosage (2.4 kg/t dry) and of 28% in energy consumption (from 60 to 43 kW/t). The net cost saving was greater than 10% and AOX in paper were on target (figure 2). Low AOX and efficient WSR (source: Kemira). Wet strength resins’ promoters represent a complementary technology that helps to improve WSR efficiency; they can be either cationic or anionic. «They help rebond the charge system and retain wet strength resins more effectively. WSR are highly charged polymers», said Grigoriev. Poor resin retention and high WSR consumption might occur when fibres present an excess of cations on their surface (overcationization). The final outcome is the inability to reach the high wet tensile targets; excessive foaming can also occur, as well as felt deposits and slower dewatering. Anionic WSR promoters, such as Kemira’s anionic FennoBond, partially balance the cationic charges and improve the efficiency of wet strength resins and the dewatering process. The use of WSR promoters allows to achieve an higher wet tensile target and to keep foam under control, as reported in the case study presented by Vladimir Grigoriev, where FennoBond was used to in addition to WSR resins to replace carboxymethyl cellulose (CMC) (figure 3). «CMC is used for charge bonds and also for wet end size control. It is an effective old technology, it has its drawbacks. One of the main one is related to safety of workers, because of the dust of the CMC powder and the slippery floor», said Kemira’s representative. The powdered form of CMC requires significant investments into make‐down equipment. CMC may be also subject to biological growth and deposits, and its tendency to disperse fines and mineral ash in papers increase the demand for retention aids. CMC usually requires a cationic counterpart in the wet end, tipically a cationic PAE resin, to assist with retention to anionic fibres. PAE provides cationic sites on fibres for retention of CMC, whereas CMC rebalances the fibre charge, allowing for additional retention of the PAE resin. This approach is especially typical for kitchen towel production. The use of anionic FennoBond presented by Vladimir Grigoriev allowed to maintain wet and dry end site targets and to lower WSR dosage of 22% and the cost in use of 10%. Case study: CMC replacement (source: Kemira). Cationic wet strength resins are glyoxalated polyacrylamide (GPAM) derivatives indicated for the manufacturing of toilet paper, hankies and away-from-home towel grades, as they improve dispersibility of the sheet in water. Cationic WSR promoters react with cellulose to form etheric bonds. They improve the initial wet strength and the temporary wet strength, as well as the dry strength and the dewatering process. Kemira’s representative Dr. Grigoriev presented a case study where cationic FennoBond was used to increase tissue strength and reduce the refining energy. This last one decreased from 55 to 37 kWh/t (-24%), wet strength resins’ consumption of 13% (figure 4). «This gave flexibility to the customer and reduced consumption of wet strength resins», concluded Vladimir Grigoriev. Partial replacement of WSR (source: Kemira).